J.V. Peacock has been an avid biker for years. He has always practiced safe biking. His number one rule: Never bike without a light. Bicycles and cars, they’re two very different forms of transportation. But when it comes to the rules of the road, they’re not so different. Bikes move with traffic as runners or walkers run against traffic. Though bikes are allowed on the road, Peacock says cars don’t always share the road. “People don’t know that cyclists have a right away on the road they want us off the road,” said Peacock. Sergeant Ted Bohner of Indiana State Police says bicycles have the right of way just like cars. “We say it over and over but share the road,” said Bohner. 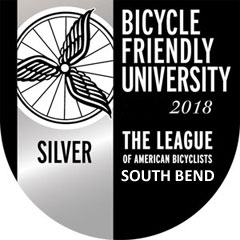 Multiple people have been hit or killed while biking in Michiana in the past month. Just last week a woman killed while biking in Edwardsburg. Indiana State Police say these recent crashes make bike safety that much more important. “Put down the distractions. Be alert. Give a minimum of three feet so that you’re passing a bicycle safely,” said Bohner. Peacock says the number one reason he always stays safe on the road is because of his lights. “From now on my light will be on whether it’s light or dark out. It will be on my handlebars,” said Peacock. He has lights all over his bike. “This is probably the top seeing light on the market. This is a very bright light- back light. The more you can be seen by an oncoming car the better off you’ll be,” said Peacock. It’s also important to wear light clothing while biking. “I’m wearing this jersey and the most bike jersey we sell are bright,” said Peacock. 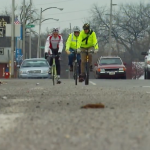 Indiana State Police say even though a lot of the accidents can be blamed on drivers, bicyclists need to follow the rules of the road as well. “You’re a bicycle but you’re still a vehicle so to speak, so stop at stop signs. Make sure it’s clear if you’re going to have to be turning left or right. Look behind you or have mirrors on your bike so you can see traffic behind you as well,” said Bohner. Always remember, the best advice for riding a bike is to always wear a helmet.